Our son Fjord is 5 years old, over a period of about 4 months he developed terrible insomnia. His bed time is between 7.30pm and 8pm but he would lie in bed for up to 2 hours every night unable to fall asleep. He has a fixed bed time routine, we eat around 5.30pm, he baths at about 6.30pm then has a story and a night-time drink which is usually milk, milo or fruit juice. After his story we give him a cuddle and turn out the light. After asking around and searching the internet I found that one thing that I had not tried was Chamomile Tea. 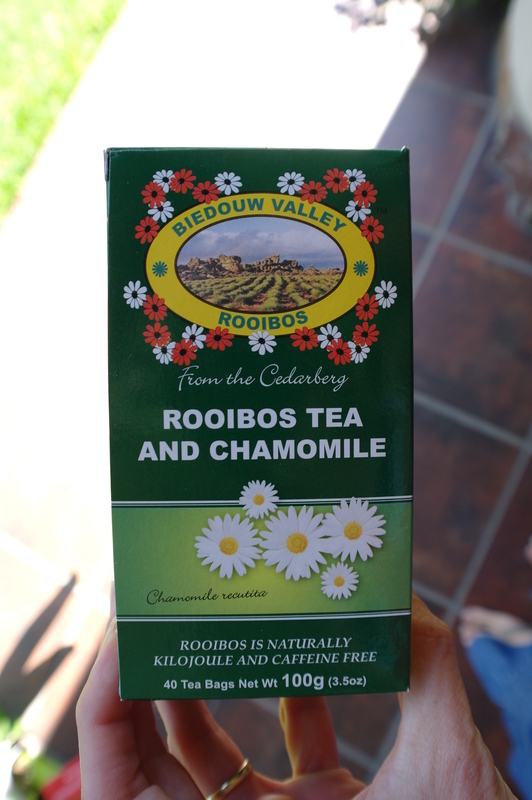 When we were in Cape Town I found a Rooibos and Camomile Tea made by Bidouw Valley and bought it, not expecting this to make much difference. I was amazed when the first time he tried it he was asleep within 20 mins. I have been curious as to whether the tea is what really helps so we have alternated bed time drinks over the past month, he has also had fruit juice, milo and Strawberry milk on other evenings. I can now conclusively say that on the nights which he has the Rooibos Chamomile tea he is asleep in under an hour, often as quick as 15 mins. On the nights that he drinks something else he still lies awake for up to 2 hours. After a few nights falling asleep quickly on Chamomile tea we thought that his sleeping pattern may have corrected and tried another drink, once again he lay awake for a long time and even said “I wish I had chosen Chamomile Tea”. When this box of tea runs out I will have to find another brand but that should not be a problem. I have considered that the effect may well be part psychological, I have told him that this tea helps him to sleep. It is therefore possible that the mental side may be a large contributing factor. Whatever it is that helps I’m not complaining, we have at last found a solution to his insomnia and it’s a good healthy answer.